Hopefully I got the day right this week, haha, but it’s time for a Friday post! 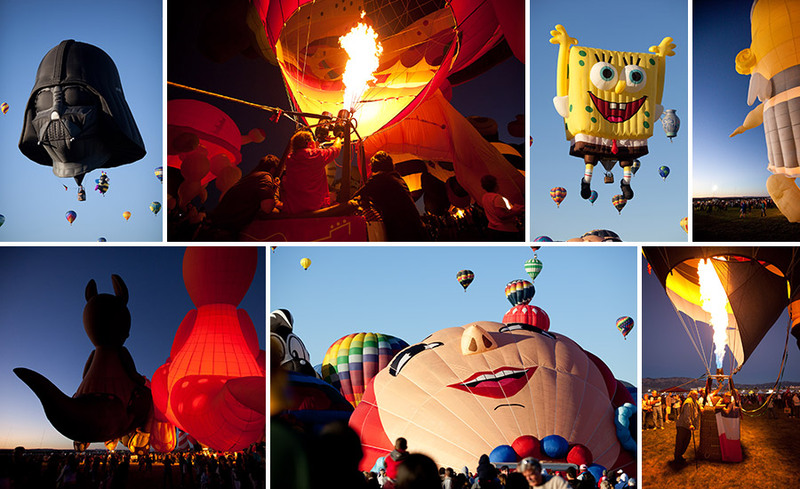 This is a collage of our fun trip to Albuquerque last weekend and the balloon fiesta. We had a great time with my family, visiting Santa Fe and watching the balloons. The trip made me a wee bit homesick, as I really love New Mexico and remember my childhood there fondly. So many cool local traditions, beautiful scenery, yummy food and fun family times. We brought a ton of camera gear with us (photographers don’t travel lightly) but didn’t end up taking too many pictures really. It was more difficult during the fiesta to watch the kids and take pictures than I had imagined. Jordan didn’t drag out his funky Cambo for pictures, and used the Canon (which I mainly use) to take some cool high def videos etc. We got separated several times in the crowd of 200,000 people, which meant I took maybe 5 pictures total. Jordan got some cool shots in between the videos though, so I am going to post his pics and call it a “guest spot” on my blog, haha! Hope you enjoy his photos!